While visiting the in-laws, we stopped into this small Hawaiian deli and grocery store for one of their plate lunches. My selection was Kalua pork (no relation to Kahlua liqueur). Moist, tender, smoky pulled pork. Served with two huge scoops of purple rice, potato-mac salad, and an insanely tasty pineapple-carrot slaw, and a little bit of kimchee. Enough food for two people, even. Delicious! My husband selected the ahi tuna poke, which was tasty, and came also with the same purple rice, potato-mac salad, pineapple carrot slaw but instead of kimchee, they gave him a little bit of seaweed salad. This was good but the tuna poke was partially cooked (health code issues?) whereas my experience with poke in Hawaii was that it should be raw, a la tuna tartare. Regardless, he enjoyed it a lot. They expect to start serving shave ice again in April, and have apparently just started a Hawaiian-style baked goods program, but we didn't partake. An unexpected find in suburban Milwaukee! Thank You! Another place I never would have heard about if it wasn't posted. I will have to try it out tomorrow since we will be in the area. Was not able to get there due to kid's school activities that he did not let us know about until the last minute - hopefully soon! I had to pick up some passover things for a couple of elderly shut-ins that live by me at the Kosher Meat Club, and continued on to have lunch at Ono Kine Grinds today. I was expecting to get a pork dish as it is what I expected from a hawaiian place - but they had just brought out some ribs and the plate passed under my nose as it was being brought out and it smelled GOOD. The ribs were done Korean style and were called "Angus Prime Beef Ribs". Very good, slightly saltier than I would have done myself. The Kim Chee was way too hot for me - but I am not a spicy food fan. The sticky rice was very good, the (Hawaiian Salsa? Salad?) was excellent. The macaroni salad was very bland. Very friendly people. Very small place - I think there was seating for 20 at best and that would be crowded. I am planning on going back, I am torn between the Kalua Pork or the Yellowfin Ahi Poke. I will be trying the Lomilomi lox the next time as well. The time after that will be the smoked chicken. Thanks for pointing out this place - I also have a place to go to for loud hawaiian shirts now as well. Oh - the flavored bottled lemonade that they were selling was sub-par IMHO, but that has nothing to do with them. Next time I'll get a root beer from the cooler. Ono Kine Grindz will be closed next week for vacation, reopening May 2. Another thing to know about them is that they are closed every Monday and Tuesday and only open 10 a.m. to 8 p.m. on the days they are open. They are a short walk from our Milwaukee hangout, and I've been meaning to post about them, and will get around to it real soon now. Small and funky, part grocery store, part restaurant, Ono Kine Grindz seems a very LTH type of place. From the front door, you wouldn't realize they they serve prepared food. The shelves are stocked with a variety of Hawaiian, Japanese and Korean products, including candy, hot sauces, spices, mixes and other cooking supplies. Notable items include Hawaiian red salt and Japanese rice seasoning blends. They also sell Hawaiian shirts. Guy Roeseler, a Brookfield, Wis., native, is the chef. He formerly owned a French provincial restaurant in Seattle. His partner, David Lau is the Hawaiian, although both of them lived there. Lau runs the front of the house; he also has much experience in the hospitality industry, including the Pfister Hotel. Opened in 2010, this is apparently their "retirement" business. They have very good Kona coffee, free wifi but that's all I'd had there till recently, since I'm not much of a luncher out and they close at the time I usually start thinking about dinner. They also do smoothies, made with soy milk and protein powder. And, on weekends in season, shave ice. The menu of plate lunches is succinct. Each is served atop two big scoops of Korean purple rice and accompanied by an addictive pineapple-carrot slaw and what I'm sure is very authentically bland potato and macaroni salad, slick with mayo, plus a garnish -- in our case, mild but pleasant kim chi. Except for the coffee, food comes mainly in disposables: foam boxes and plastic cutlery. The kalbi, beefy and otherwise well seasoned, are as exvaxman noted, overly salty. I'm very fond of salty food, but I had to ask for a glass of water. I'd order it again, but the salt-averse should beware. Four strips of short ribs makes a generous portion. They're on the chewy side, too, but not unpleasantly so. 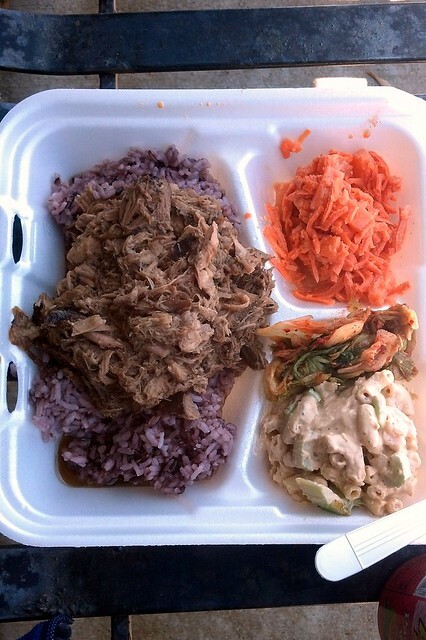 Kathryn's description of the kalua pork -- "Moist, tender, smoky" -- says it all. They also do catering, and I'm thinking an LTH dinner in the near future might be a good idea. kathryn wrote: They expect to start serving shave ice again in April, and have apparently just started a Hawaiian-style baked goods program, but we didn't partake. Shave ice will start May 19 -- it's summer weekend afternoons only. We stopped in this week to discuss setting up the upcoming LTH dinner and sampled some desserts. Guava cake and coconut cake were both delectable. While having a pleasant lunch here the other day, Ono Kine Grindz' highly affable owners, David and Guy, made mention of an outdoor paina (aka luau) they're planning on Saturday July 21 (noon-8pm-ish). And if I heard correctly, the festivities will also include Polynesian dancing performed by Hale o Malo. If the vittles are at all on par with their beautifully smoked, mango glazed huli huli chicken, attendees will be in for some special eats. They are closed until after July 4th holiday. This information is not mentioned in their voice answering machine. Nope, you find out as you arrive looking at a darkened storefront with a note tacked on the door. Fortunately, Mom1 remembered McBob's was nearby, which soothed our disappointment rather well. Cathy2 wrote: Fortunately, Mom1 remembered McBob's was nearby, which soothed our disappointment rather well. Ah, but you can't get corned beef with a coconut and mustard glaze at McBob's. Here's lunch at Ono Kine Grindz last week. A most excellent tub of food (and the rice almost matches the color of the meat). Further proof (if any were needed) that Milwaukee is a great corned beef town. By the way, corned beef is only an occasional special at Ono Kine Grindz, not a regular menu item. Here's more on my first trip to Ono Kine Grindz last summer. Nice people, interesting shop, well-prepared food, great value. This fine little place really deserves more attention. On some hot days a shave ice stand is set up in front of the store. Didn't try. Inside, the lower front part is a small shop selling some Hawaiian specialty foods, shirts etc. Place your order at the counter then find a table upstairs. After we'd ordered one of the owners showed us a plate of their corned beef, a special of the day, so we had to get one of those too. That's our lunch for two (and it was so good we came close to finishing it). An order of pork hash (a/k/a shu mai) opened our meal. This is the only thing I wouldn't particularly recommend. Not bad but other than the name there's nothing particularly memorable about it. Kalua pork is a good version of pulled pork, cooked out back over wood, I think. That sticky purple rice soaks up the juices nicely. Seaweed salad was a particularly fine example and the potato salad and kimchee were good as well. This mango-glazed chicken was a bit overcooked and slightly dry but the sweet crispy skin was as good as it looks. I'd certainly order it again. That tomato salad was very much worth eating. Corned beef cooked with a coconut-mustard glaze might not sound inspired but in their hands it works brilliantly. An excellent plate of food (yes, even that shredded carrot salad). Yet another demonstration that Milwaukee is playing in a different cured brisket league than Chicago. I expected to like this place but I wasn't expecting it to be quite so good. "Da One Stop Aloha Shop"
Chiming in again, because this place has been terrific every time I've been there. We don't get there as often as I'd like because they close even earlier than most Milwaukee restaurants, but I love it every time. I had the shave ice on a hot day last summer and it was wonderfully refreshing but pretty much like a finely shaved snowcone. Did the tomato salad/salsa have salmon in it? If so, I think that's lomi lomi salmon. The Shave Ice has its own brand/schedule on their web site and on Facebook. Thursdays and Saturdays in front of Ono Kine Grindz during the summer. Glad to see that they have flavors like Li Hing Mui, but they don't seem to offer azuki beans or ice cream on the bottom, or condensed milk on the top, unfortunately. LAZ wrote: Chiming in again, because this place has been terrific every time I've been there. Any suggestions of daily specials to look out for? kathryn wrote: Did the tomato salad/salsa have salmon in it? No, it was just a simple salad of tomato and green onion in vinaigrette. Nothing fancy but it was well done. I once called in advance to find out when the mango glazed chicken would come out of the smoker. I arrived about an hour after the predicted 3:00 pm pull. My chicken was far paler than yours, which after my first experience suggested it was under smoked. I think they pulled the chicken for me and likely I would have had a different experience an hour later. Knowing about places like this makes visits to Milwaukee even more enjoyable. Rene G wrote: By the way, corned beef is only an occasional special at Ono Kine Grindz, not a regular menu item. Nothing new to report but I think it's worth highlighting this great little place that hasn't been mentioned here in a while. I stopped at Ono Kine Grindz fully intending to try something different but corned beef was the special of the day again. I didn't realize that Thursday is corned beef day. The colors may clash but the flavors are harmonious. The mustard glaze/gravy seemed considerably more assertive than the last time. Not a bad thing, though I might consider getting it on the side to control how much goes on the rice. An excellent—and very generous—plate of food. These guys really care about what they're doing. Next visit I will try something different. Thank you for pointing out their corned beef. I will be there this week. I usually hit HOCB on Silver spring, which has the most awesome corned beef in Milwaukee, IMHO. Second location opening up on the east side. Spartan Gyro is ok, (76th and Mill) but not awesome. His Pastrami however is expensive but to die for. Rene G wrote: Next visit I will try something different. I made a meal of two sides my last trip a couple months back. 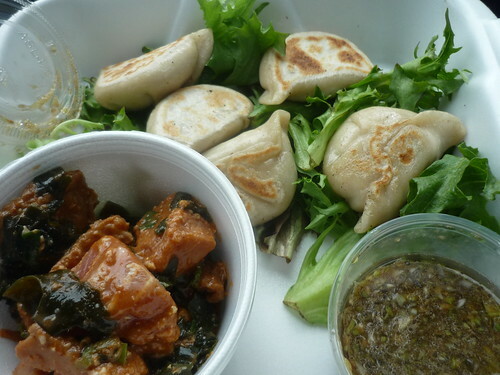 Some tuna poke and (I forget her name)'s Dumplings. Perfect eats on what was a hot day. The dumplings are vegetable based but still had really solid flavor with the garlic ginger dipping sauce being spot on. Rene G wrote: Ah, but you can't get corned beef with a coconut and mustard glaze at McBob's. Here's lunch at Ono Kine Grindz last week. This is the Best Thing I've Half-Eaten [Lately] and Will Be Trying to Finish [Today]. Important Update (3/19/14): I have prevailed! Damn, this is some tasty stuff. I'd been looking forward to a visit here for a couple years--since I first read about this place when the thread began. I found myself in Milwaukee a couple weekends ago and so made my pilgrimage. In a word: disappointed. Probably partly my own fault, but my plate lunch was nothing like any plate lunch I ever had when I lived in Honolulu. The kalua pork was, as reported several times above, excellent: smoky, tender, juicy. And a huge portion. I've got nothing against the purple rice (actually Korean black rice which becomes purple when cooked) but I never had a plate lunch with anything but steamed white rice. And the mac salad was just plain odd. Looked simple and straightforward and so I was thrown for a loop when I took my first bite. I don't know what the secret ingredient is, but it was definitely not a plain, unadorned mac salad that is usual. The carrot/pineapple salad was very sweet but I also found the inclusion of kim chee a little odd. Given the add-ins, I have to wonder whether the chef or the owner or someone with a Korean bent isn't tilting the table here. I expect I'll visit again next time I find myself in the vicinity, but I'll probably ask some more questions, see what the options are, and study the menu a little more closely before I order. Last edited by Gypsy Boy on June 30th, 2014, 1:22 pm, edited 1 time in total. Gypsy Boy wrote: I'd been looking forward to a visit here for a couple years--since I first read about this place when the thread began. I found myself in Milwaukee a couple weekends ago and so made my pilgrimage. In a word: disappointed. Probably partly my own fault, but my plate lunch was nothing like any plate lunch I ever had when I lived in Honolulu. The kalua pork was, as reported several times above, excellent: smoky, tender, juicy. And a huge portion. I've got nothing against the purple rice (actually Korean black rice which becomes purple when cooked) but I never had a plate lunch with anything but steamed white rice. And the mac salad was just plain odd. Looked simple and straightforward and so I was thrown for a loop when I took my first bite. I don't know what the secret ingredient is, but it was definitely not a plain, unadorned mac salad that is usual. The carrot/pineapple salad was very sweet but I also found the inclusion of kim chee a little odd. Given the add-ins, I have to wonder whether the chef or the owner or someone with a Korean bent isn't tilting the table here. I appreciate the report and see what you mean, but I'd rather be disappointed by extra / unusual flavors than a lack of flavor. This report actually makes me want to detour there more! How does Aloha Eats rate on the plate lunch spectrum? Santander wrote: I appreciate the report and see what you mean, but I'd rather be disappointed by extra / unusual flavors than a lack of flavor. This report actually makes me want to detour there more! How does Aloha Eats rate on the plate lunch spectrum? Fair enough. I guess it's as I said, partly (largely?) my fault: Thomas Wolfe was right. And, after so many years, I probably have the Platonic ideal of the plate lunch in my mind. That said, I just flat out didn't care for the rice (here I would truly have preferred the blandness/lack of flavor of plain steamed rice) and thought the kim chee both too mild and not particularly interesting. I guess I can conceive, at least, of the kim chee working better as an add-on. But it would have worked better if it had played off a straightforward rendition of mac salad--the other item I really didn't like. Milwaukee Journal Sentinel offered their recipe for Hawaiian Kalua Pork. Owners David Lau and Guy Roeseler sent the recipe. Lau wrote: "I must confess, when I used to hear people refer to cooking kalua pork or kalua pig, I naively assumed the pork was marinated in Kahlua liqueur. I also wondered why it did not pick up the sweet flavor like the liqueur when I tasted this dish. Instead it had a nice salty and smoky flavor. "When I decided I wanted to learn how to cook this dish, I was surprised to learn that Kalua referred to the method of cooking meat underground. 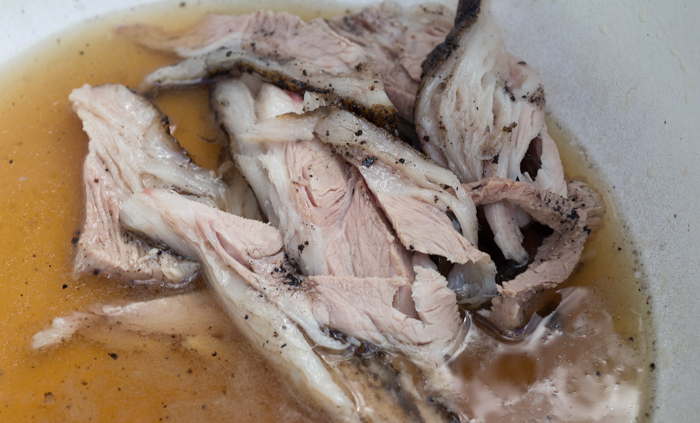 As an alternative to an underground method, an easier cooking method used by many Hawaiian locals today, and especially in the mainland United States, is to rub the pork shoulder in Alae sea salt (also known as Hawaiian red sea salt), wrap it in ti or banana leaves, and slowly cook in an oven with Wright's all-natural liquid smoke. Their Pineapple-Carrot Salad recipe is also available. I have attempted to make this at home, though there is an ingredient not used because I never heard of it: Li Hing powder, which is supposed to be ground plum skins. I'd leave out the liquid smoke and cook it in my smoker, like a Hawaiian would. I'm not sure a smoker would be authentic either. I'm pretty sure most Hawaiian's would be using liquid smoke. That is of course when they're not actually burying the pig underground. I made an kalua pork at one of the montrose BBQ potlucks. I laid some smoked bacon on top of the shoulder, wrapped it in banana leaves, then smoked it in the WSM. When tender (just short of shreddable), I then ignited the banana leaves directly on the coals before unwrapping it. Authentic? No, but I must admit that it was the best kalua pork, if not the best pork, that i have eaten. 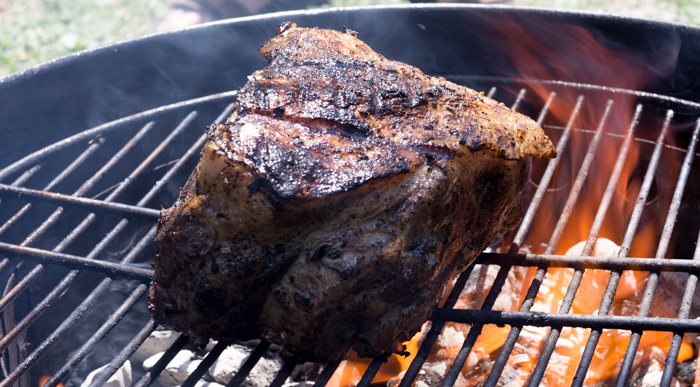 stevez wrote: I'd leave out the liquid smoke and cook it in my smoker, like a Hawaiian would. Last time I was in Hawaii, a native told me, it's not traditional, but yeah, we use liquid smoke. laikom wrote: I'm not sure a smoker would be authentic either. I'm pretty sure most Hawaiian's would be using liquid smoke. That is of course when they're not actually burying the pig underground. I made an kalua pork at one of the montrose BBQ potlucks. I laid some smoked bacon on top of the shoulder, wrapped it in banana leaves, then smoked it in the WSM. 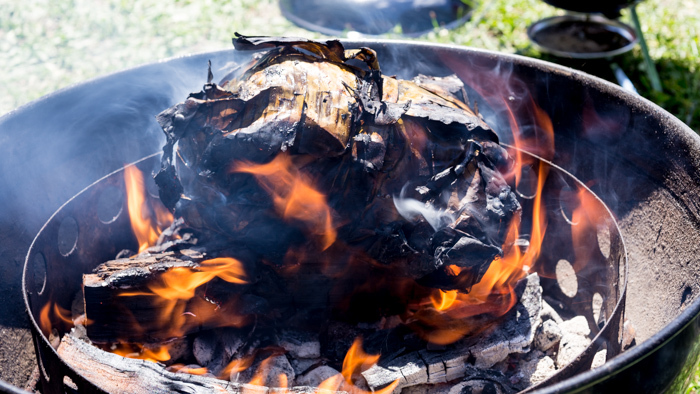 When tender (just short of shreddable), I then ignited the banana leaves directly on the coals before unwrapping it. Authentic? No, but I must admit that it was the best kalua pork, if not the best pork, that i have eaten.